The amount of wasted sleep due to bad sleeping conditions can make a lot of people go crazy. Yet upgrading your bed is no longer the only progress that needs to be made in the bedroom; what about the pillow? Some like one, others like to be surrounding in pillow heaven. The most important part is that your head is in a comfortable enough position so that falling asleep is easier than 1-2-3. Pillows come in all different shapes and sizes, and different materials. They come with scents, colors and are backed by major brand names. So the simple question is which one is right for you? 10 What Are Memory Foam Pillows Made Out Of? Low priced and coming with a viscose rayon cover, this elegant pillow comes in both king and queen sizes. This is an improved design that is more functional and better looking than its predecessor, with a bamboo derived cover comprised of 60% polyester and 40% bamboo. The USA made pillow is a very nice buy even if you don’t get the improved design. Coop Home Goods isn’t a top brand name, yet they make some of the best pillows in the industry. The memory foam in the pillow is not cheap, and is made out of a good inhouse mix of shredded visco elastic memory foam that is adjustable-that’s right, an adjustable foam pillow. This unique feature lets users add or remove foam to their comfort level so that they can get the proper alignment while sleeping. This is a big help for hard to please sleepers that are in a different position each night. It also means this pillow is great for side sleepers, back sleepers, stomach sleepers and more. The pillow uses CertiPUR-US certified foam, and it is a hypoallergenic and dust mite resistant product for homes with sensitive allergies. Included is a 5 year warranty that guarantees usability within that time, and it is also machine washable! As the first memory foam pillow on the list it is one of the best, and comes highly recommended for anyone that wants a good night’s sleep. Langria introduced their hot selling memory foam pillow a while back, and though it is high priced, it is still one of the better buys on the market. This is one of the highest quality memory foams you can buy, and no matter your sleeping position it maintains great comfort through some of the worst sleepless nights. Due to its high and low loft, there is no need to adjust it as much as other pillows. So depending on how you sleep, simply switching the high with the low will give you the proper support for a good night’s rest. Recommended sleepers for this type of pillow are heavy snorers, sleepers with aches in their bodies and anyone with breathing problems. The design of the pillow promotes healthy breathing while sleeping and even adjusts the spine for comfort. And the best part of the pillow is the least mentioned, with that being the ventilated soft knit cover. It’s on both sides of the pillow and keeps everything cool while you sleep. That means no sweating in the middle of the night and waking up to an uncomfortable pool of sweat. The standard color is blue and white, and isn’t spectacular by any means but does the job. Langria uses a one size fits all mantra with this model and it works, so no need to worry about ordering the wrong size. Comfortable and luxurious, this is another top pick in the early rounds. 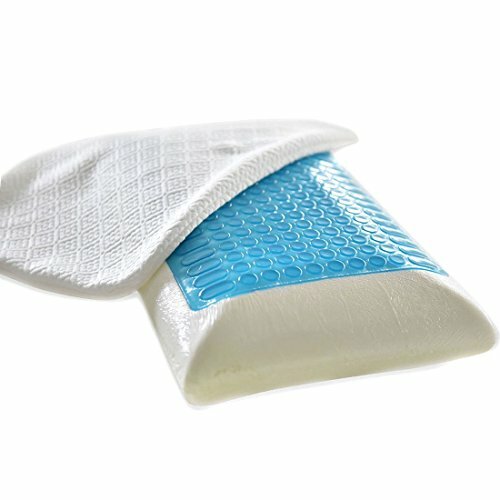 In the low priced bracket is the FY-Living Reversible Cool Gel Memory Foam Pillowm which is more than meets the eye when considering the materials. 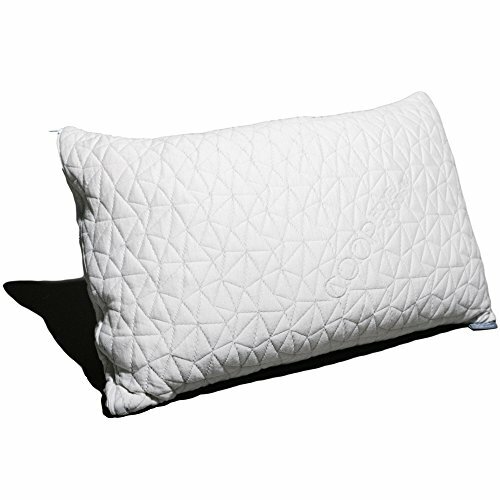 The one size fits all pillow uses a 100% polyester cover that is removable and perfect for anyone with allergies. There are no harsh chemical odors coming from the pillow, making it very breathable and safe to use with kids. Now the reason that a lot of people purchase this pillow is the doubled sided memory foam, with each side serving a different purpose. One side is medium-soft and is considered the memory foam side which is great if you live in a cool environment. The other side is medium-firm and has cooling gel making it perfect for colder environments. It is a win-win situation for any type of temperature, and it is like getting 2 pillows in one. Beyond the double that it is a comfortable pillow that can even relieve neck pain, something that can stay with you for an entire week if you sleep wrong. No matter how much you use it, the pillow will keep its shape and provide the necessary support you need to get a good night’s sleep. Dimensions are 21.7×4.9 and makes it ideal for all children and adults, and a great gift for anyone that is looking for a new pillow. Buyers that want to get the most for their money will love this pillow, as it is a deal that can’t be beat for the price. Possibly the highest priced memory foam pillow on the list, it also functions as one of the original and best choices for memory foam. This pillow isn’t overstuffed to the point where you sink in and mold, but is thin and provides the absolute best neck support on the list. Any type of neck stiffness or pain that you have felt with older pillows will go away once you get a good night’s sleep with this one. Despite its thinness, it has great support for both your head and neck. Since there is less memory foam to sink into, it takes seconds to mold and find the sweet spot that gets your body in a mood to sleep. 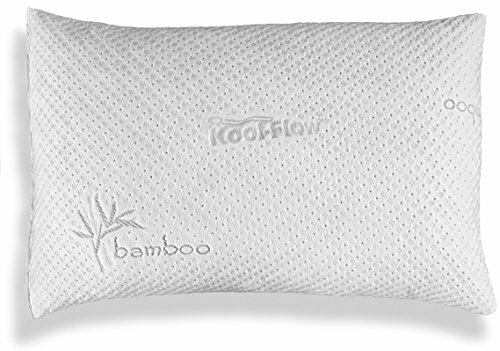 It works fast and it keeps its shape better than any other pillow on the list. This pillow is ideal for sleepers that move a lot through the night. Since it molds quicker than any other pillow on the market, it requires less time to adjust to wild sleepers and their ever changing sleeping habits. And for wild sleepers that used to be calm sleepers, you’ll notice less tossing and turning through the night once you get this pillow. Best for stomach and back sleepers, this is one of the absolute best values on the list. Side sleepers may want to avoid this model as thin pillows won’t quite have the same effect as thicker ones. Fantastic from top to bottom, the one size fits all slim sleeper is a work of art in memory foam. Medium priced and available in king, queen and standard, this is a one of a kind memory foam pillow that targets several consumers with its features. Starting with the cover, customers will be treated to a patented Kool-Flow micro-vented cover. It is made of 43% viscose from bamboo and 56.4% polyester. So where is the extra .6% going? To the lycra of course! This added material is comparable to big brand names like Sleep Innovations when it comes to keeping you cool at night, and believe it or not it works wonders! The high quality memory foam does a good job over the years of not going flat, and is machine washable so you can get rid of any stains and odors that it collects over use. 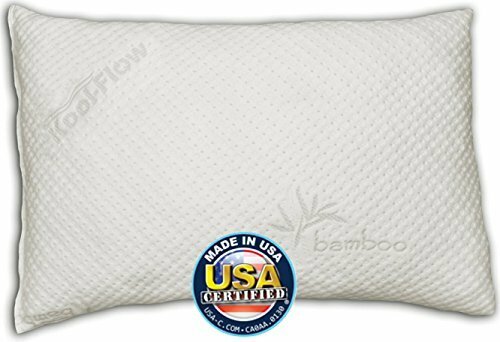 Made in the USA, the pillow use Biogreen and Certipur-US certified foam making it a big deal in homes that have adopted the green lifestyle. These rugged pillows are guaranteed for 20 years and are the cream of the crop when it comes to memory foam pillows that work right out of the box. Suitable for all sleepers, get a great night’s rest whether you’re a side, back or stomach sleeper. About the only negative to speak of with the pillow is that it has a basic standard design! 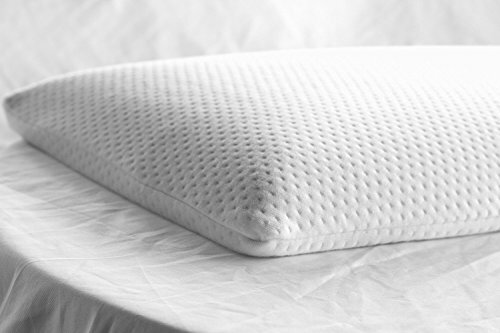 The Snuggle-Pedic is one of the highest rated memory foam pillows in the industry from both reviews and top ten lists. Buyers that want to take full advantage of the cooling abilities of the pillow should refrain from putting third party covers on it. Other than that, this is a great memory foam pillow that really guarantees a comfortable sleep. Available in queen and king at a low price, the Classic Brands Conforma pillow is a pretty good choice if you’re in the market for something new. It is imported and uses a cotton blend to please sleepers of all types and sizes. The included memory foam is hypoallergenic and dust mite resistant, with visible ventilation holes so that the memory foam can breathe and stay cool at night. This works better than advertised, and may be one of the best implementations of the technology outside of using gel memory foam. So if you’re worried about all of the chemicals included in a gel memory foam setup, this is the best option to keep your allergies in check and your home green. Classic Brands also included a velour cover that is soft to the touch and fully machine washable. It isn’t cheap add on velour, as many people have compared it to other velour items in their house and been impressed with the quality. 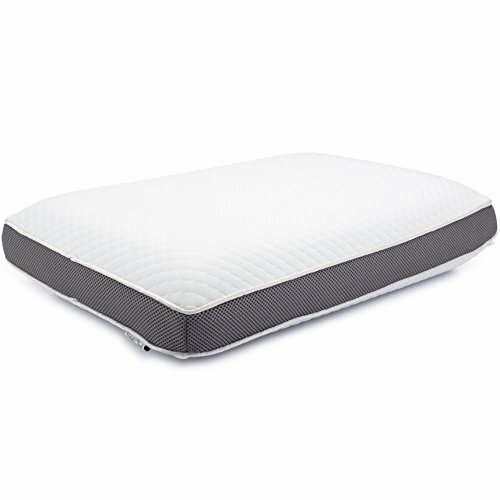 The aerated memory foam really does a good job of keeping the temperatures set when sleeping, and there is a 3 year warranty to back it up. It should be noted that while the pillow does last for years, it doesn’t keep its shape as long as some of the others on the list. This isn’t a necessarily bad thing, just understand that it is prone to wear and tear within 5 years compared to some of the others than can go 10+. But if you want a great pillow that has one of the best cooling technologies on the list, then this will be the best buy. This is the second memory foam pillow on the list with dual sides that offer two different sleeping experiences. It is high priced, but also high end when looking at the features. Sleepers will get fantastic support for their head, neck and spine when using this pillow on either side. The support isn’t temporary, and hard sleepers can depend on constant support from the moment they lay down to the moment they wake up. Buyers that are active through the day will get a lot of pain relief with the pillow by using the air comfort gel memory foam to cradle the neck properly and relieve stiffness. 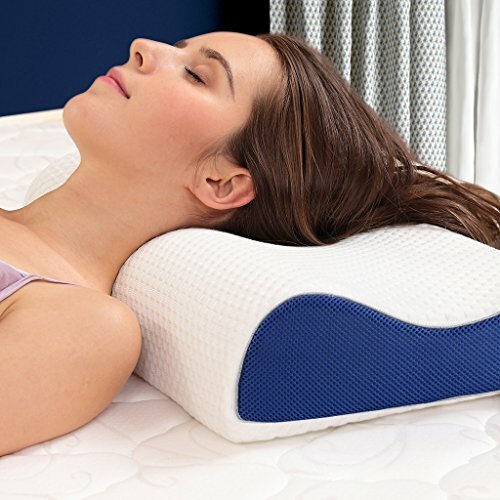 This pillow supplies the second best neck support of any item on the list, so if you have neck or spin problems, then this should be in your top 3. Perfect Cloud also produced one of the few gel infused memory foam pillows that is also hypoallergenic and safe for people with bad allergies. It is a rare combination that puts it in the running as the best gel based pillow to buy for homes with people that suffer from allergies. But the winner in all of the features is the dual option sleep options. One side is for users that like firm pillows, while the other is ultra-soft and like a cloud. With ventilation holes and gusset siding, it is a high class option that will last for years. This is a great buy for all types of sleepers, and will be a favorite of yours for years. Last on the list is the medium priced Xtreme Comforts Shredded Memory Foam Pillow, which is almost like a made for television pillow. While the marketing department is a bit too pitchy when it comes to the pillow, there is no doubting just how great of a deal it is. Available in queen, standard and king, this is the #1 rated bed pillow on Sweethome. 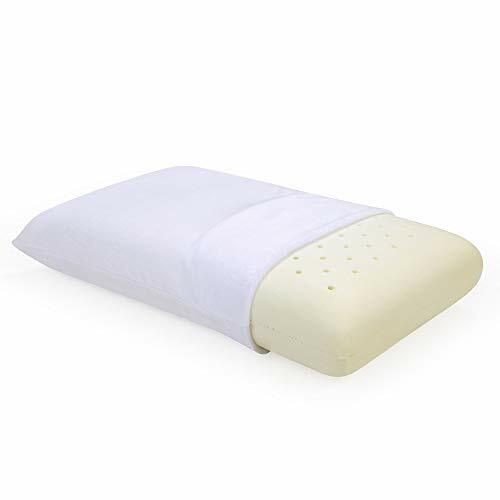 The big seller here is that it is a shredded memory foam pillow of high quality and provides a comfort level that is hard to match, even when compared to other pillows on the list. CertiPUR-US standards were followed carefully to ensure that the materials are safe for any home, especially those with children. they also added a 6 year warranty and stand behind their problem with some of the best customer support around. Considered to be one of the biggest surprises on the list, this is a memory foam pillow that gets the job done for all sleepers. Don’t overlook this great buy, as the brand has delivered on expectations and then some! Just like memory foam mattresses, memory foam pillows serve to provide more comfort when it comes to the bedroom area. Because even the most comfortable mattress isn’t really worth anything if the associated pillow is hard as a rock, or too soft to be comfortable. Memory foam pillows come in all types, shapes and sizes, with the important elements being the type of memory foam they use. While gel seems to be one of the most preferred materials for memory foam mattresses, for memory foam pillows it is not the worst nor the best. The technology is still being improved, and as a result there are a lot of great choices available for consumers to purchase. What Are Memory Foam Pillows Made Out Of? This is where things get a little complicated for most users, since the materials used in a memory foam pillow are very important to the end user. Remember that allergies are a real and dangerous thing, and with pillows being that close to the nose, harsh chemicals and germs need to be kept to a minimum. Memory foam pillows keep things simple, and most if not all of them are hypoallergenic. As a bonus, there are plenty on the list which are also dust mite resistant, adding yet another layer of protection. There are two main versions to consider, each with their own advantages. Regular memory foam is just polyurethane with additional non-harmful materials. With memory foam pillows, it is enhanced in various ways to offer breathability and air flow options, keeping things as cool as a gel infused memory foam pillow. This type of pillow is at its best when it comes to keeping its shape over the years, and also for those that want a better ‘molding’ experience. Gel memory foam pillows are also fantastic for the user as they provide a better cooling experience. The gel models always have that great touch, which the downside being a shorter lifespan than a regular memory foam pillow made out of polyurethane. But this isn’t a bad thing, as that lifespan is still years beyond a regular pillow made out of cotton or feathers. Gel memory foam shapes just as good as regular memory foam, and has the same breathability standards. Both of these options usually include a pillow cover with bamboo elements in it, and buyers should definitely give preference to memory foam pillows of that type. It guarantees that no matter the materials on the inside that you can sleep on a hypoallergenic and dust mite resistant pillow. The great debate rages on! And the short answer is this- everything should be memory foam. The material is no longer the future, it is the present and the future. Top brands have adopted the technology and have their own proprietary blend that is built in-house. NASA and hospitals use memory foam as a requirement, and the price of a memory foam component is now less than that of a regular mattress. So trying to choose between memory foam options like pillows, toppers and mattresses will get you nowhere if you don’t plan on fully adopting to the new technology. So if faced with the task of deciding, get what fits into your budget. If you can only afford the mattress, consider getting a memory foam pillow+combo topper instead for the same price. Your body will thank you for it later, as body aches and pains gradually withdraw from your body. The top benefit comes from the companies that manufacture memory foam pillows being a lot more aware about allergy specific homes and chemicals used in their products. Back when memory foam pillows were in their infancy it was not a reliable product for the masses, but now it has superseded regular pillows in that they carry less germs. Not only less germs, but less dust, bacteria, and all (if not most) are fully machine washable. So by that token, depending on what you use to wash your pillows, they can have any scent you want. There are specially made scents just for pillows that are sold as sprays, and guess what they work best on? Memory foam pillows! An obvious health benefit to using memory foam pillows is that they will always adjust according to the way you sleep. This helps for people with neck problems and spine issues as you are no longer forced to sleep according to how your pillow wants. With memory foam pillows, your body goes into its natural position when sleeping and forces the pillow to adjust. This is a huge benefit, and one that should not be overlooked. All memory foam pillows on the list should be considered if you’re living in a non-memory foam home. The change will be amazing, and your first night’s sleep will be one that you never forget. Take the time to go through the list and you’ll find the pillow of your dreams!